At Growing Smiles Pediatric Dentistry, we believe that it is a privilege to treat children. We know that each patient we see is a unique individual. Dr. Eduardo “Eddie” Perez and our team specialize in pediatric dental care, so your child receives the one-on-one attention needed to ensure that his or her growing smile develops healthy and with each tooth erupting properly and at the right time. Through our words and actions, we promise a fun, caring environment to ensure that you, your family, and your child feel right at home. By using a “show and tell” concept, Dr. Eddie and our clinical team explain procedures before we perform them, which not only eases a child’s mind but also promotes understanding and acceptance of examination and treatment. Our practice features a calm, soothing environment where each patient can feel safe and secure. From teething and thumb sucking issues to routine exams and cleaning, and cavity prevention and treatment, you need a dental team dedicated to the oral healthcare needs of young patients — from infants to teenagers — including those with special needs. By providing a dental care program that minimizes tooth decay and cavities, we aim to give you and your child the tools to practice good oral hygiene habits for beautiful, growing smiles that will last a lifetime. 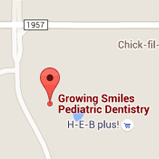 Contact our San Antonio, TX pediatric dental practice to schedule an appointment with Dr. Eddie. We look forward to helping your child grow up with a healthy, happy smile. Call today!